How many times have we said that the Surface would be great, if not for its OS? The truth is, the Surface RT and Surface 2 were lovely, well-crafted things, with great screens, solid build quality and long battery life. We just wished they could run the full gamut of desktop programs, in part to make up for a limited selection of Windows Store apps. Well, it seems Microsoft has finally reversed course. The company just unveiled the Surface 3 and, as rumored, it comes loaded with full Windows 8.1. A more full-featured OS also means a more robust processor -- specifically, an Intel Atom CPU similar to what you'll find in Chromebooks and other budget machines. Additionally, the screen now supports pressure-sensitive pen input -- something the higher-end Surface Pro could always do, but never the Surface RT. All told, although Microsoft is still calling the Surface a tablet, it might finally be versatile enough to take on not just other slates, but low-end PCs as well. With the newest Surface, the most notable difference really is the operating system; the actual hardware is very familiar. If you look closely, you'll see the tablet is a bit thinner and lighter (0.34 inch thick/1.37 pounds, versus 0.35 inch/1.49 pounds on the Surface 2), and the logo is also different. If anything, the most notable change is the display: Whereas the Surface used to have a 10.6-inch screen with a 16:9 aspect ratio, it now measures 10.8 inches with the same 3:2 aspect ratio as the larger Surface Pro 3. (That new screen size means the resolution is now 1,920 x 1,280, not 1,920 x 1,080.) As I mentioned earlier, like the SP3, the Surface now supports pressure-sensitive pen input for the first time, with the same N-trig pen digitizer used in the Pro. In fact, that's a big part of the reason why the screen now has that 3:2 aspect ratio; as on the SP3, Microsoft wanted the display to look and feel more like a sheet of paper. Otherwise, the Surface has generally the same design as before, including a magnesium case with blunt, chamfered edges and no cooling vents. The Surface's signature kickstand remains too, except whereas it used to be more adjustable, it now supports just three positions. 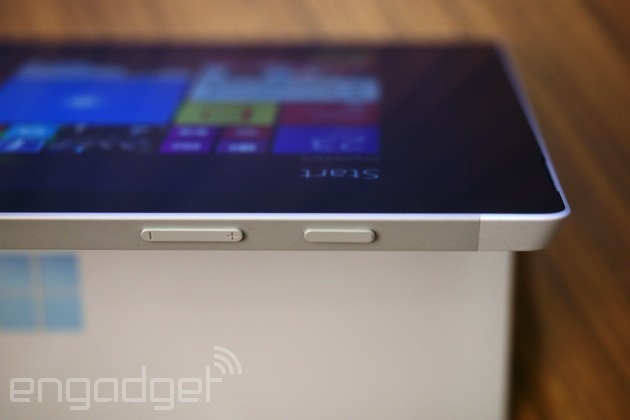 (Microsoft says this was a concession to help keep the device's price -- and thickness -- down.) As for imaging, the front-facing camera still tops out at 3.5 megapixels, but the rear cam has received a bump from 5MP to 8MP. The ports are also mostly the same: a full-size USB 3.0 connector, headphone jack, volume rocker, microSD slot (hidden under the kickstand) and Mini DisplayPort. Of note: The Surface is rated for 10 hours of runtime, and it now charges through a regular micro-USB socket, as opposed to the proprietary connector used on past models. Hooray for being able to use standard cables! Speaking of proprietary connectors, the Surface still has those pins on the bottom side that allow it to click in to Microsoft's Surface keyboards. This time around, Microsoft is only offering the "Type Cover" (the one with the physical buttons) and not the "Touch Cover" (the one with the flat keys). Really, though, if you happen to own an older Surface, any of the old keyboards, even the Touch Cover, will work here. Just keep in mind that because the tablet's dimensions have changed, the old keyboard covers won't line up perfectly with the device when you fold it shut. Still, I'm sure for some of you that won't be a dealbreaker; you'll be happy to avoid spending $130 on a brand-new keyboard. The Surface 3 goes on sale May 5th, starting at $499 (keyboard still not included), with two choices of configurations: a 64GB model with 2GB of RAM, or a 128GB version with four gigs of memory. Like other Windows 8.1 devices, it will be eligible for a free upgrade to Windows 10 once the new OS comes out later this year. There will also soon be an LTE edition, starting at $599. For the first time too, the Surface has an optional dock accessory, similar to what's currently offered alongside the Surface Pro 3. That'll include four USB ports, along with an Ethernet jack and an additional Mini DisplayPort. Once I get a chance to review the Surface 3, I'll be interested to see how it stacks up against low-cost PCs. I mean, sure, you could compare it to the iPad Air 2 or a high-end Android slate, but to me, that's only half the story. If you're shopping around in the $499 range, it's awfully hard to find a laptop with this nice a screen -- a full HD touch panel that also supports pressure-sensitive pen input. Now that the Surface can run any Windows app, though, it has the potential to be the best bang-for-your-buck PC -- even if it does look more like a tablet.